3D printing has already penetrated dental industry. Dental technicians have already started using 3D printing methods to manufacture orthodontic equipment’s like dental implants, brackets, surgical tools, impression trays, etc. For an R&D design prospects of 3D printing, there are several type of production methods including Fused Deposition Modeling, Laser sintering, Stereo lithography, Digital Light Processing, Electron-beam melting, Laminated object manufacturing, Direct Metal Laser Sintering , etc. Based on our Research Analysis, Production methods like Selective Laser Sintering, stereo lithography, fused deposition modeling and 3D Inkjet Printing seem to be the most promising ones for the future. Big players like Ivoclar Vivadent, Bego Medical, Dentsply Sirona, and 3M are focused in the above mentioned methods of additive manufacturing. The research for SLS process, SLA process, 3D Inkjet printing is mainly focused in China, USA, Japan respectively; However the market is spread worldwide. USA and china are the top research countries whereas Europe seems to be the emerging market. USA, the research on Metals is being done in China, USA, Europe and Germany, the research on ceramics is being conducted mostly in USA. The use of ceramics is decreasing, the use of polymer as a material for additive manufacturing is increasing thus giving rise to the development of antimicrobial materials as well. While dental equipment manufacturers, material suppliers, technology vendors have already started using it on a commercial level, we expect 3D Printing to have a tremendous impact on the supply chain of the entire industry and extend itself into numerous relative application areas. To define, describe, and project the 3D printing for dental based on application, material, production methods used in 3D printing, scanning and modelling techniques, technical challenges faced and regions of interest (research and market areas- country wise analysis). To analyze major players in the domain by focusing on their patent filing trends, their research centers, markets of interest, technology focus, partnerships, strategies and other important parameters. To analyze new entrants into market segments, key patents- area wise- a legal and business angle, prominent innovators and service providers. To track and analyze competitive developments such as joint ventures, mergers and acquisitions, new product launches, expansions, and other activities carried out by the key industry participants. To analyze the opportunities offered by 3D printing technology in various segments of dental industry. To identify key disruptions (their impact and their current state analysis), mega trends predictions and considerations for the future, recommendations for starting new research/ development programs in 3D printing in dental (including recommendations on acquisition/ collaborations/ licensing). This report is a Handbook of Innovations & Technologies (HIT), in the 3D printing domain and provides insights into the technical challenges, existing solutions, innovation trends, market trends and key participants in the innovation ecosystem. This report is essential reading for everyone associated with the domain of 3D printing in dental industry, providing clear answers to problems and issues faced, enabling them to take key decisions. For example, this report can be beneficial to CEOs, heads and members of R&D departments, heads and members of IP/strategy departments, heads and members of HR departments, heads and members of marketing departments, academic researchers and scientists, patent agents and/or attorneys, as well as investors and consultants operating in the domain of both the 3D printing and dental industries. When did patenting activity in the domain start and how has it evolved? Which countries are suitable market geographies for utilizing this technology? Who are the major players involved in this technology? What potential collaboration opportunities are available with smaller players? Who are the recent entrants? What are the different activities being taken up by the major players? 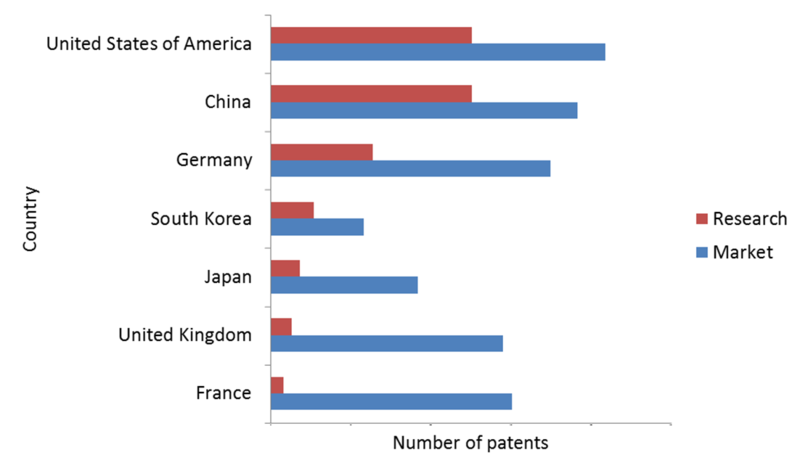 Which are the best patents and who owns them? What are their patenting strategies and areas of focus? How do the major players compare against each other in terms of IP potential, R&D capabilities and strategy? Which countries are the innovation hubs for this technology domain? Which research institutes / universities work in this area? Which technology areas are most focused on research and development? What are the latest technological advancements in the domain? What are the different 3D printing processes used? Which specific materials are used for 3D printing in the dental industry? What are the major technical challenges associated with various processes, materials and modelling techniques? Which companies are filing patents in different materials for respective 3D printing techniques? Who are the key inventors / experts in different technology areas? What is the area of expertise for the key inventors? Which law firms are available in different jurisdictions? What is the grant rate and average grant time for respective law firms? Who are the examiners in the domain and what is their grant rate? Which art units are available for the patent filing and what is their grant rate and grant time in the domain? What are the major IP stumbling blocks (dark spaces) in 3D printing in dental domain? What are potential industry segments where patent portfolio coverage could be extended? How to draft better inventions (optimized scoped) and prosecute efficiently? 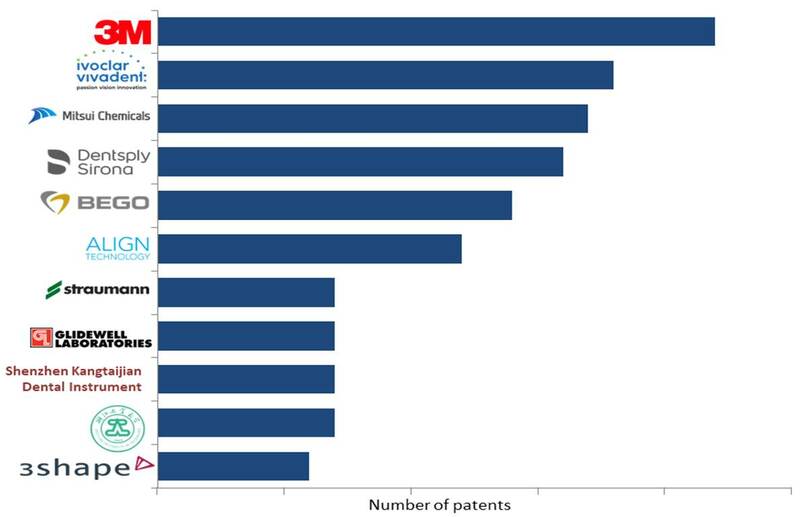 What patenting strategies are being adopted by major players in 3D printing in dental domain (jurisdictions, type of claims, patent maintenance, etc.)? What are the major law firms/agents involved in 3D printing in dental domain? To prepare this report, multiple diverse searches were conducted to comprehensively identify all the patents pertinent to 3D printing in the dental industry. These patents were then analyzed manually to capture their focus and application areas and identify the technical challenges. Thereafter, informative and actionable insights were generated by combining this manual information with the bibliographic information of the patents. Expert industry analysis has also been included as part of the research. This section highlights technology evolution (patent filing trend), primary countries of research, major market geographies, existing collaborations and opportunities, new entrants, key patents, most active law firms, prominent inventors and important IPC classes, key Player’s IP position in the domain of 3D printing. 2. Detailed technology analysis of patents and applications published in technology domain. This section highlights the focus of patents and applications w.r.t. the production method used in 3D printing, scanning techniques disclosed, material used for 3D printing, applicable products being targeted and the challenges. This section provides an analysis of the major players in the domain focusing on their patent filing trends, their research centers, market of interest, technology focus, partnerships, strategies, and other important parameters.